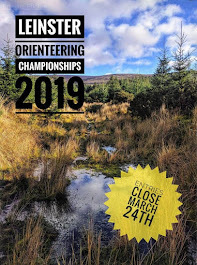 Curragh Naas Orienteering Club: Donegal Three Day. Thanks to Dee for the following report..
Last weekend the annual Irish 3 Day event was held near the beautiful Lough Eske in the Bluestack Mountains. There were mixed feelings over returning to the challenging area as last year’s Irish Champs; for some it was a weekend of fantastic victories while for others the most vivid memories of that weekend were the pouring rain the dense fog the waist-deep marshes and the long haul to the start. Just over a year later however everything was different. Saturday dawned warm and sunny, with not a breath of wind turning the wind turbines visible from the start. The event centre was at the local Community Centre, with a steep 1km walk to the start at Benson's Hill. Starts were not until 4 in the evening, meaning all the orienteer’s been relaxed and ready to race. All of the eight courses were very technical and of middle distance, but due to the blistering heat were surprisingly tough. The terrain was a fabulous open mountain with undulating hills, very intricate contour detail, many horrible marshes but very few tracks. Rock features were very useful for navigation. CNOC performed well, with many good results on some very competitive courses. Among them were Ruairí Short and Séamus O Boyle on the Men’s 21 Elite course, in fantastic 4th and 7th places respectively. On the women’s Elite course, Orla Jennings came a close 4th, with Eileen Loughman 8 minutes behind her in 5th place. Caoimhe O Boyle finished her course in a fast time of 24 mins in the W14 class, winning her first place. I (Deirdre Ryan!) won myself the W16s course with a few minutes to spare, a surprising but very pleasing result! Beginner Regina Kelly finished 6th on W21S while Ollie Clear came 3d on the M35s course, only a few seconds away from 2nd place. In the highly competitive M50s CNOC swept away first and second place, with Sennan O Boyle coming in less than two minutes behind Pat Farrelly. Don Short came 7th on the same course. Finally, Bernie O Boyle cleaned up the W50s with an easy win. Sunday morning came too soon, and once again too hot to be running in. There was a longer 2km trek to the start, with longer and with more climb. Day 2 started at Croaghmeenare, circling around some beautiful lakes and gruelling hills. Once again, courses were technically difficult only today they had physically challenging thrown into the mix too. CNOC collected a few more victories- Seamus 2nd on the Men’s Elite while Ruairi dropped a few places to number 8. Unsurprisingly Caoimhe retained her lead among the W14s. I lost a few minutes but came in a happy second place on my course. Ollie clear ran to 2nd on his course, with Pat and Sennan once again battling for first and second place. On the same course Don Short came in 8th place. Bernie widened the gap between herself and second place again, winning easily. Nerves were running high on Monday morning as people tried to mentally prepare for the stressful Chasing Start at 10am. The winners of each course set out first, with the remaining competitors starting later according to the total time they trail. The first person over the line on each course was the overall winner of the weekend. At the start at Bensons Hill on Monday morning adrenaline was pumping and I for one was super nervous, starting first on my course. Courses were the longest yet, but almost luckily the sun stayed hidden all day and temperatures remained in the high teens. The area was the driest of any of the days, with many of the marshes having dried up a bit throughout the weekend, so terrain was more runnable today than the previous days. Out on the course, orienteer’s had to concentrate on their own race and remain completely unfazed by the many other hectic competitors out on the mountain, be they on their own course or not. In the overall results at the end of the day, Seamus finished an amazing 4th on the Elite course, with Ruairí on his heels in 5th. Orla finished 5th on women’s elite with Eileen in 6th. Caoimhe won an overall 1st place in W14. I made stupid navigational errors on my course losing my large lead (and then some) but coming 2nd at the end of the day. Ollie Clear kept his second place in M35. One of the highlights of the finish line were two CNOC men Sennan and Pat fighting for first place on the run-in. The exciting sprint finish ended with a joint first place! Minutes after the prize giving as everyone was making their way towards the cars, the heavens opened for the first time all weekend- lucky! Overall the 3 day event was thoroughly enjoyed and well organised (thanks to WEGO! ), with great orienteering opportunities on great new terrain. Hopefully CNOC will return next year to retain all of our titles!